Downtown Dothan This Saturday Morning - You Would Not Believe The Crowd :: RickeyStokesNews.com! DOTHAN: This morning as I was going east on Main Street and glanced up North Foster Street it was filled with cars and people. I then turned north of Foster to see what was going on. Downtown Dothan was a "dead zone" years ago. It was a vision of Dothan City Manager Mike West and former Mayor Pat Thomas and former Mayor Jimmy Grant to revitalize downtown Dothan. Many were very skeptical. But they kept moving that direction. If you know Pat Thomas and Jimmy Grant , they are ( former Mayor Grant has passed away ) bull headed and stubborn. When their minds get focused in a direction no one can change it. And Pat went forward and continued with their plan and vision. 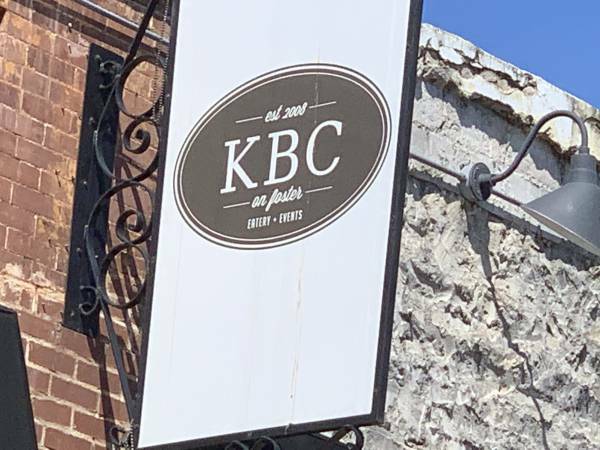 Today three anchors in downtown Dothan, one made famous recently, is KBC located at 151 North Foster Street. The owner, Kelsey Barnard Clark, recently the winner on THE CHEF, located her business in Downtown Dothan. A decision in 2008 when it was not viewed as the most desired location. KBC's chef and proprietor Kelsey Barnard Clark is a born and raised southerner from Dothan, Alabama. She got her start in the food industry as a mere middle schooler with a baking obsession and did her first catering gig at 16. 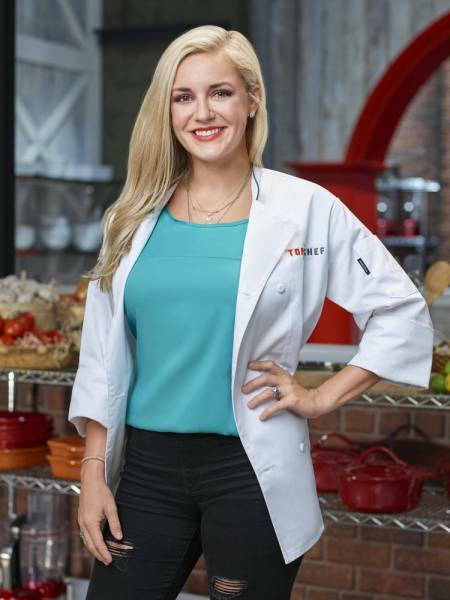 Kelsey left the deep south for a few years to learn from world-class chefs at the Culinary Institute of America in New York. 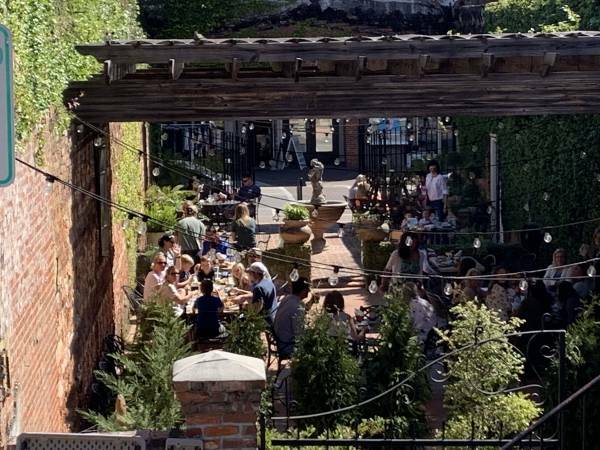 She fine-tuned her skills working for Manhattan's top restaurants Cafe Boulud and Dovetail before returning to her roots in Alabama to launch her business, now known as KBC. Kelsey's passion is whole food, prepared classically and plated with big city flair. 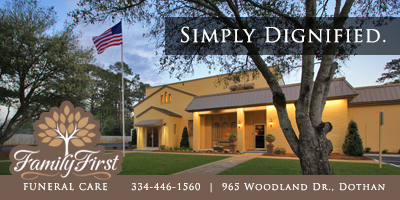 Come see KBC and you are promised you'll TASTE and SEE the difference. Clark’s restaurant and catering company, KBC, is a Dothan staple where on any given day you’ll find a line of eager folks piled up around the block, just waiting to experience her take on Southern classics infused with French techniques. And that was the crowd in Downtown Dothan on North Foster Street. 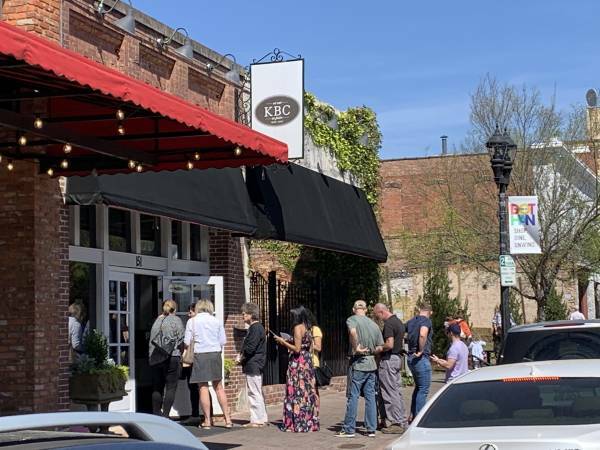 People lined up out the door waiting for the Saturday morning dining experience at KBC. Estimates are, this morning in downtown Dothan, some 500 people dined at KBC. Unbelievable. 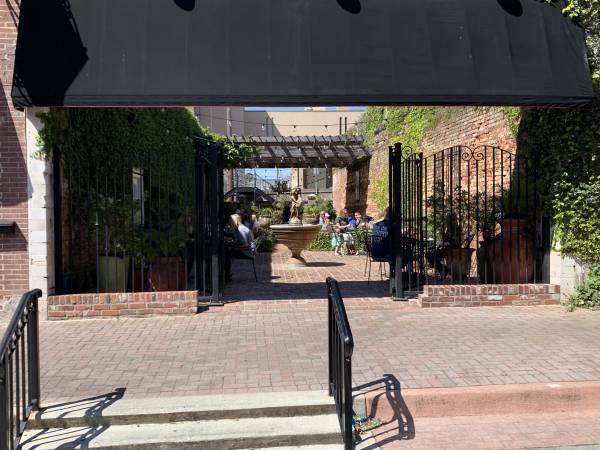 No one ever thought, except Pat Thomas, Mike West and Jimmy Grant that downtown Dothan would ever really make a come back. But it is and the crowds this morning helped prove that the plan is working. But those around Kelsey will tell you, she is very "hands on" making sure everything is done right. That the meals and dining experience are the best.